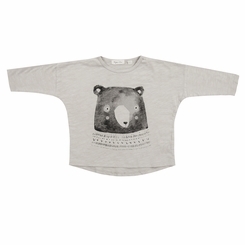 Super soft Dove colored longsleeve tee with Mr. Bear graphic print. Back hemline has a gentle dropped curve. Made of 100% cotton slub jersey. This product has been garment dyed, giving it a vintage look and feel. Machine wash 40c, tumble dry low.